Episode 178 of the MakingChips podcast equipped and inspired the Metalworking Nation to evolve their workholding systems. This episode featured a special guest, the man who taught me everything I know about workholding, the one who equipped and inspired me to think differently about manufacturing - my Uncle Alvin. Alvin Goellner, Business Development Leader at AMROK Workholding, has spent his life getting the most out of milling machines. His career began as a machine operator running manual, and eventually CNC mills in his father’s machine shop, Advanced Machine & Engineering (AME). From there, he supervised the entire milling department. That’s when he discovered just how much time was wasted bringing out the machine’s spindle to indicate every vise or workholding component to make sure it was perpendicular and parallel on the machine table. When you hear him tell the story of how the milling department at AME began to evolve, the first thing you’ll hear him talk about is the moving from T-slot tables to precision grid plates. We launched the AMROK workholding brand on the back of the success we had in our own shop at AME. Now we travel throughout North America sharing ‘workholding wisdom’ with other shops. I’ve probably heard Alvin say, “I don’t believe in indicating anymore” at least a thousand times, but to be honest, I didn’t know what that meant until I began to understand the benefits of the precision 2-inch grid plate after watching the process of squaring a vise to the machine table. The process of indicating a vise on a T-Slot table. When I sat down to write this, my first thought was to get out of the office and head into the shop at AME to see what our machinists thought about T-slots versus grids on a sub plate. Why not hear it straight from the people running the machines? So I grabbed Alvin and we headed into the milling department. The first guy we talked to was Zach H., a 10-year veteran from the AME apprenticeship program, who is now lead machinist on the CNC mills. I asked him how long it takes to drop a vise on the table and get it set up to clamp a part to begin machining. Then I asked Zach how long it would take if it was a T-Slot table. I asked him what it would be like without the grid. When Alvin was my age he was constantly getting hassled by his father (my grandfather, Willy Goellner) wondering why jobs were taking too long to get through the milling department. Alvin couldn’t afford long set-up times. Fast forward 40+ years, and you see precision grids on everything at AME -- tables on vertical mills, tombstones on horizontal mills, riser blocks, consoles, etc. We even order our new machine tools with blank tables and machine our precision grids directly into the table. As we continued through the shop, we did find one operator, Mark C., without a grid working off of T-Slots. He was working on a large Ikegai boring mill. When we asked him why he didn’t have a grid on his machine, he said, “I’ve been asking for one for a while. If I had one, it would be much easier to get my set-ups in line. My approach to set-ups would change completely because, it would be so much more convenient and efficient to find the locations of my components if everything was based off of an alphanumeric grid. So precision grids make life easier on the machinist, but what’s the advantage of 2-inch spacing? Grids are relatively common on workholding foundations, but the spacing varies between manufacturerers. So what makes the 2-inch spacing the right choice? The short answer is that it’s the most universal, ‘open source’ solution for your shop. Manufacturers who sell grid tombstones and grid plates want you to buy their brand of modular components to mount on the grid to complete the fixture. Some brands lock the end-user into their system and their components by utilizing a weird spacing, a 5-inch spacing for example. We also see a lot of plates and columns with metric spacing. 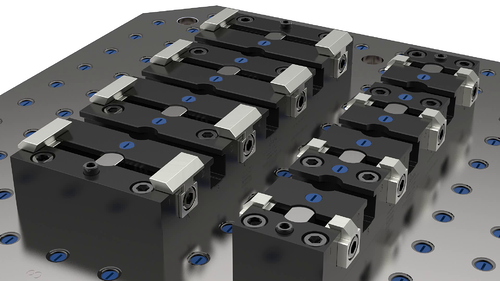 The next most common spacing to the 2-inch system is a 50mm spacing, but the majority of workholding component manufacturers in the U.S. use a 2-inch standard grid, which opens up more possibilities because just about anything you’ll ever need will fit on that system. 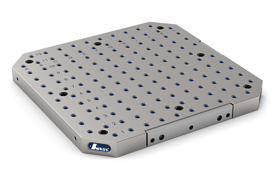 Even some European manufacturers, such as the Triag system from Switzerland Alvin mentioned in the podcast, offer modular systems on a 2-inch spacing as a standard. Imagine you buy a new CNC vertical mill for 50k. It comes standard with a T-slot table, and you charge a rate of $100/hr. If you change jobs relatively frequently and add components or vises to the table, you can easily save yourself a few hours a week by adding a grid plate and eliminating the need to indicate vises in. If the precision grid plate costs 4k, the payback from the time saved on indicating would come in a matter of a few months. This doesn’t even factor in the options that are opened up by adding modular fixturing systems to the grid, or the ease of use, and the ability to standardize set ups. Standardization allows for better continuous improvement programs and allows engineers to make process plans more simple for the machinist to follow. It also makes it easier to maintain the continuity between shifts and between operators with varying levels of experience. Using a dial indicator to square a vise on a machine table or tombstone is a necessary skill for a machinist to learn, but it’s a step that can be eliminated on machines with a precision grid. Manufacturing leaders can dramatically improve the throughput of their CNC milling department by evolving beyond the T-Slot and implementing a grid system throughout the shop.